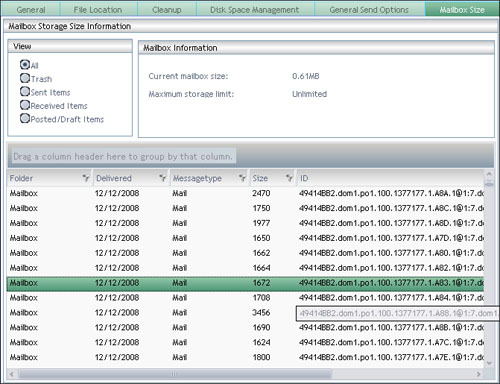 How do I check the size of a user's mailbox? Use Vertigo to check size of a individual's mailbox. 1) Open Vertigo and connect to your GroupWise system. 2) Select the the user's mailbox that you would like to view the size. 3) Click on the "Environment" tab. Then below, click on the "Mailbox Size" tab. Note: As it states in the warning message, this is an intensive Post Office scan. Please use with discretion. Note: You won't be able to see the contents of the message. 5) You can also sort to see different types of messages. This article was originally published in the GWAVA knowledgebase as article ID 1022.